Briefing on “Media Freedom for a Better Future: Shaping the Post-2015 Development Agenda” in commemoration of the World Press Freedom Day 2014. Free media, traditional and new, are indispensable for development, democracy and good governance, United Nations officials said today, spotlighting Press Freedom Day – observed annually on 3 May – to urge Governments, societies and individuals to actively defend this fundamental right as a critical factor in achieving internationally agreed development goals. 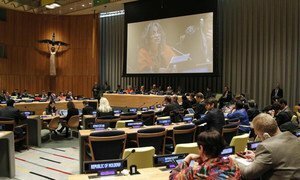 Peace and stability are vital if sustainable development is to take root and flourish, United Nations officials stressed today as the General Assembly met to consider how these essential conditions can contribute to eradicating poverty and ensuring well-being for all.